It started, as so many things do, with mockery. So, yes, I have a bit of a problem with acquiring books. My local library has a phenomenal friends of the library booksale that has nice-quality stuff for $1 or less. BookMooch has also been a dangerous, dangerous place for me. I got my TBR pile down under 100 books by last Christmas, but then I got/purchased about 35 books over the holidays… and since then, no matter how much I read, my pile keeps growing rather than shrinking. Not that that’s a bad thing, per se – I shudder at the thought of waking up one morning and having nothing in the house that’s new to read. However, my list of unread books is currently at 171; should the zombie apocalypse come tomorrow, I would have almost a year and a half of reading material at my current rates. Methinks that’s a tad excessive. 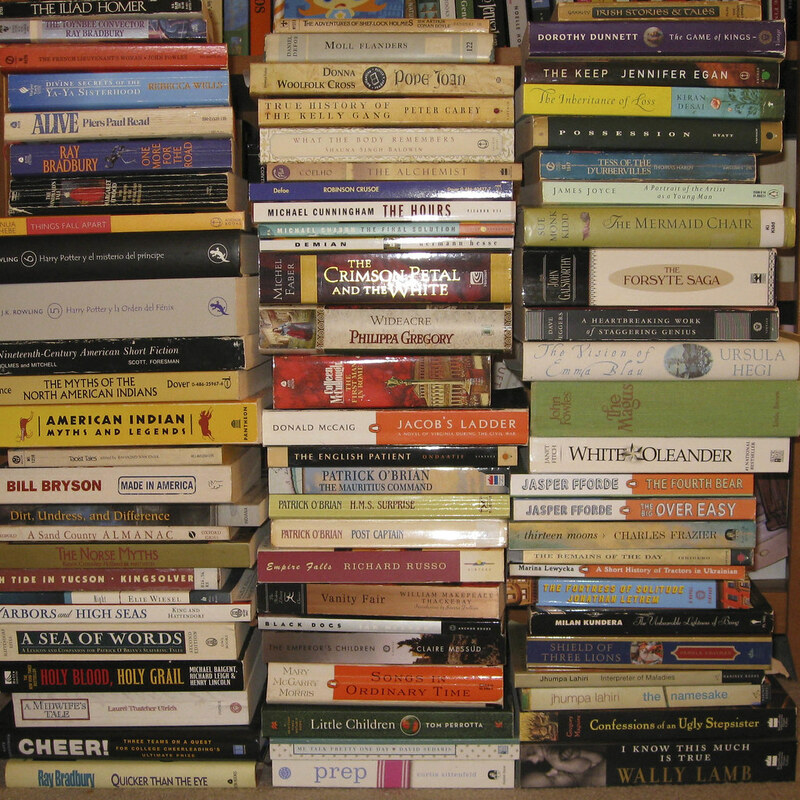 Plus, my “about” page says that my TBR stack would be twice as tall as I am. Having nothing better to do tonight, I decided to see if that was true. So, I’ve learned two things from this little experience. 1) That many books falling on your head, even if they are paperback, hurts. A lot. Stupid fatty-fat fantasy books. 2) I really, really need to slow down my rate of book acquisition and read the books I *ACTUALLY OWN ALREADY*. Hence, Ye Grande Olde TBR(e) Challenge! I’m currently at 171 books in the house that I own that need to be read. I’ve read 67 books in the first half of the year (actual book-books, I’m at 84 counting audiobooks). My goal is to get my unread stack of owned books to 120 by Christmas. That’s going to be tough, especially considering there are several books that are coming out this fall that I’m going to have to get from the library: Breaking Dawn by Stephenie Meyer, The Hero of Ages by Brandon Sanderson, Brisingr by Christopher Paolini, Hawkspar by Holly Lisle, A Dance with Dragons by George R. R. Martin, and probably two or three others I’m forgetting. The trick is going to be a) not to request any *other* books from the library until 2009, and b) to stay the hell away from the booksale. Can I do it? Want to join me? 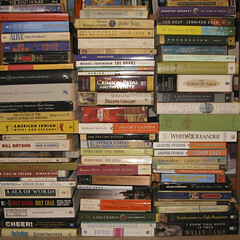 Count up your TBR books, pick how many of them you want to read between now and 2009, and let me know. If enough people are interested, I’ll make actual official little challenge graphics and stuff. I hadn’t thought about ARCs that way, but they’re definitely TBR. I’ll count up what I would ultimately like to have read by the end of the year in a perfect world and add a few to make it that much more challenging. Excuse me while I go check my BookMooch wishlist… again. I am probably not helping your resolution, but I just wanted to point out that, should the zombie apocalypse happen tomorrow, your books won’t last as long as they would now, because you’ll have little to do but read while hiding from zombies in your house…. Hmmm, that’s a good point, although time would have to be spent barricading the windows and doors, devising weaponry, and foraging for food – we don’t have a particularly apocalypse-ready pantry. Toss in some re-reads, and the TBR stack would still probably last about a year. Seriously, I was thinking about joining your endeavor until I hit that line. I’ve reserved a copy of Brisingr already… and Breaking Dawn, though I don’t know if I even like the Twilight series since I’ve never read any of them! The bookstore manager who’s suppose to be my friend (she’s a book pusher, really) talked me into it saying if I don’t want it, I don’t have to buy it… YEAH, right! That’s how I ended up with two copies of VALIS, I ordered at the bookstore then found a copy, but bought the book out of guilt and obligation. koolaidmom – Heh! I’m certainly not suggesting that we stop acquiring books (the horror!) I’m just trying to start reading books faster than I acquire them, instead of the other way around.